Excellencies. Religious Leaders. Women Leaders. Ambassadors for Peace. Distinguished delegates from throughout the world. Ladies and Gentlemen. Thank you for participating in this very important International Leadership Conference. As you know, one year ago, my beloved husband of 52 years, Rev. Dr. Sun Myung Moon, ascended to the spiritual world. At this time, we gather in honor of the first anniversary of his passing, and to pay tribute to his life, his teachings and his legacy. Although my husband, True Father, has passed away to the heavenly realm, there is not a day that goes by Founders Address -- ILC Korea when I do not feel his warm presence and his guidance. I feel as if the 52 years we spent together are only being extended, day by day, even though he now dwells in the heavenly realm, and I am here on the earth. Of course, I cannot deny that the passing of my dear husband has brought me moments of great sadness. So many times I have wished we could walk together hand in hand, or sit together for a meal. Most of all, I often wish I could listen to him speaking God's word to our children, and to the worldwide members of our movement. The moments of sadness are intense, but they pass quickly. For I realize what he taught me all throughout our life together: life on this earth is temporary. This physical world is a place and a time for us to prepare for our eternal life. Each of us will ascend one day to that world of the spirit. Every moment is so precious, and so infinitely significant. He lived his life that way, 24 hours a day, from his earliest days. He seldom slept. He always lived every moment of every day with such an intense awareness of not only human suffering, but of God, our Heavenly Parent's own suffering course that came about due to the Fall and the sad history of human selfishness and conflict that has continued until today. Each person he met, no matter the time or place, stimulated him to give everything he had to bring that person closer to God, our Heavenly Parent. When my husband passed last year, I had some hesitation as to whether I could carry on his legacy in leading this worldwide movement. Could I stand in his shoes? Anytime I was visited by such a thought, however, it would quickly vanish as I felt my husband's presence and his encouragement, as if to say, "I spent 52 years with you. You were not only my beloved wife, given to me by God for the sake of his providence, but my most faithful and closest disciple. My words are your words. My accomplishments are your deeds. I tested you, and others tested you constantly, and always you endured and emerged faithfully, obediently and victoriously. I am with you now, just as much as before. And you are always with me. Let us simply continue our work as the True Parents of Heaven, Earth and Humankind." As I look at our world, I, too, can feel the pain that God must feel as he witnesses the degradation and sinfulness of human beings. God, our Heavenly Parent, created this world with a clear ideal in mind. At the very center of this ideal was the parent-child relationship, rooted in filial piety. If we consider the biblical story of the Fall of Adam and Eve, we can understand that the root cause of the Fall was the failure of Adam and Eve to stand in the position of filial sons and daughters of obedience, faith and love before their Heavenly Parent, God. Their faithlessness undermined God's ideal of True Love in the first marriage and the first family. This reality affected their own relationship to their children, giving rise to the longstanding historical pattern of Cain and Abel division that has plagued humanity up until the present time. As you recall, the first murder occurred within the first family, as the elder brother, Cain, killed the younger brother, Abel, who stood on God's side. For this reason, my husband consistently taught of the absolute centrality of filial piety in our life of faith. Only in this way can we reverse the effects of the Fall. This is why my husband and I performed the Holy Wedding Ceremonies, known as The Blessing, all over the world. The Blessing upholds the original ideal of True Love, centered on filial piety and absolute sexual purity and fidelity. The main theme of this conference is dedicated to "building a nation of peace." This is a very important concept. The one, unifying purpose and goal of our worldwide movement is to establish a nation of peace. We call this nation, Cheon Il Guk. This Korean word can be translated as a nation where "two become one." In other words, a nation where divisions of every kind are healed and overcome, resulting in harmony, cooperation and peace. Earlier this year, we celebrated Foundation Day, as the founding day of Cheon Il Guk, a unified nation that is fully aligned with the Will of our Heavenly Parent and True Parents. Following Foundation Day, I developed the 2020 Vision for expanding the realm of Cheon Il Guk. Special Envoys and National Leaders have been assigned to 43 nations. In each of these nations, our representatives will strive to serve the citizens of the nation, bringing the vision and message of True Parents for the sake of establishing a God-centered, prosperous and peaceful nation. Ladies and Gentlemen, over the next few days, please invest yourself to study and learn about the life, the teachings and the legacy of the Rev. Sun Myung Moon. Although he was badly misunderstood and even vilified throughout much of his life, that era has come to an end. Increasingly, the world is becoming aware that True Father's life and teachings provide a roadmap to peace, leading the world toward becoming "one family under God." 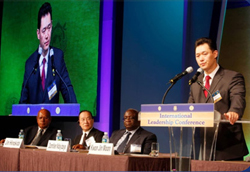 The sponsoring organizations for this International Leadership Conference are the Family Federation for World Peace and Unification, the Universal Peace Federation, and the Women's Federation for World Peace. Each of these organizations has played, and will continue to play a critical and significant role in God's providence. FFWPU, inheriting the foundation of the Unification Church, serves as the internal center and spiritual core of our life of faith. Centering on True Parents, FFWPU preserves the sacred value of our Heavenly Parent's True Love, Life and Lineage, rooted in the Blessing, and lifts up and honors God's Truth, guiding us to a life of faithful service in front of heaven, always living for the sake of others. UPF and WFWP are external extensions of the FFWPU's vision. These two providential NGOs are grounded in True Parents' vision and affirm the spiritual truths that Father Moon has taught. They expand and reach out to the wider world of other religions, nations, and societies, as well as to women the world over, and to all fields of human endeavor, including the media, academia, business, culture and civil society. We often refer to UPF as the seed for an "Abel UN" and WFWP as the seed for an "Abel Women's UN." An "Abel UN" or an "Abel Women's UN" means that there should be a global, God-centered movement which is dedicated to peace and human development. As many of you know, Abel is a biblical figure, the younger son of Adam and Eve, who was killed by his older brother, Cain. Abel was a person who had the proper heart of filial piety toward God, and he made his life an offering centered on God's will. Thus, my husband always honored and uplifted "Abel" as the example of a true filial son. Even though Cain may have had more strength or cleverness, Cain lacked the heart of a filial son. Based on external power alone, and selfishness, Cain could not establish a family, tribe or nation of peace. Only someone with the same heart as Abel can, with God's blessing, achieve this goal. Whenever my husband spoke about the "Abel UN", he revealed an inspiring vision of the human family rising up together in love, and overcoming the barriers of nationality, race and religion. He saw a vision of a God-centered United Nations. Not a United Nations based on "national self-interests", but a United Nations that was concerned about God's interests and the interests of all people as God's sons and daughters. This would be none other than a global Cheon Il Guk, guided by the principle of living for the sake of others. True Father Moon always understood peace as a profoundly spiritual concept. FFWPU, UPF and WFWP all have the word peace, pyonghwa, in their name and basic mission. The word peace describes a state of spiritual and physical harmony that characterizes the individual, the family, the society, the nation and the world. My husband did not make a distinction between the meaning of the word "peace" and the concept of "God's original ideal" or what is sometimes called the Kingdom of God. Thus, whenever he used the word peace, he always thought first and foremost of God's heart and God's providence. I encourage you to study my husband's teaching, Divine Principle. If you study carefully, you will come to understand the way in which God works in human history. At the same time, you will stand in a position where you can directly work to build the ideal world that has been the hope or all the ages, a unified word of peace. True peace begins with an attitude and practice of filial piety before God and True Parents. This basic virtue must then be combined with sexual purity before marriage and absolute fidelity in marriage. Men and women are intended to live as equal and eternal love partners. The family is created by God as the "school of love and peace." The Holy Marriage Blessings that my husband and I offered to Heaven over the past 53 years, involving many millions of couples all over the world, began as a humble path in a dense forest, but this pathway has grown to become an international highway to world peace. Lasting peace requires harmony and cooperation among religions. Believers of all faith traditions should work together in love and respect, for the sake of fulfilling the Will or our Heavenly Parent. As we stand before God, we are not evaluated by our title or the name of our religion, but by the quality of our hearts, and by the quality of our efforts to serve God's providence. I know that each of you has great responsibilities and great influence in your countries. I hope that you will take seriously what I have said today, and what you will learn over the course of the next three days, and that you will take this message back to your countries. Our worldwide movement, centering on FFWPU, UPF and WFWP, stands ready to support and work with you in whatever way we can to advance the ideal of peace, human security and human development in your nation. Let us work together to build ideal families and nations, and let us join together as people, as nations, as religions, and as families to create Cheon Il Guk, One Family Under God. Thank you and God bless you, your families and your nations.